Bandai Namco has accidentally ruined one of its E3 2017 surprises, as a Japanese press release for a new 2.5D Dragon Ball fighting game went out this morning. Called Dragon Ball Fighters, the game is being developed by Arc System Works, the studio behind the critically acclaimed Guilty Gear and BlazBlue series. This exciting partnership isn’t exactly out of left field, as Arc System Works has teamed up with Bandai Namco several times in the past to produce handheld fighting games (with 2015’s Dragon Ball Z Extreme Butōden being the most recent release). Details are currently light on the upcoming PlayStation 4 release, but we do know that the game will feature three-on-three battles. 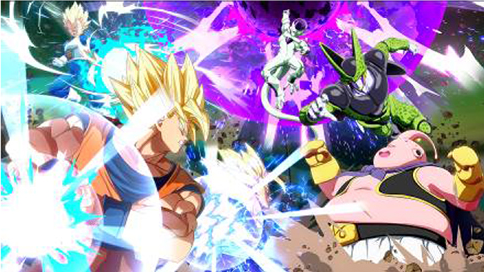 Confirmed characters from the two released screenshots include: Goku, Vegeta, Frieza, Cell and Majin Buu. Another Saiyan appears in the screens (it looks like either Trunks or Gohan Update: it’s Gohan, thanks Mr0303! ), but is slightly obscured by the sheer amount of special effects going on. According to producer Tomoko Hiroki, while Dragon Ball titles of recent years have been 3D, they chose 2.5D this time because there were some things that can only be done in that style. While it looks like 2D animation at first glance, it has a broader range of expression as they can shift camera angles and incorporate a lot of unique production not possible in 2D alone. Dragon Ball Fighters is expected to release on PlayStation 4, Xbox One, and PC early next year. We’ll know more once the game is officially announced.